Born in 1977, Ariane is a French artist based in the southwestern town of Toulouse, France. 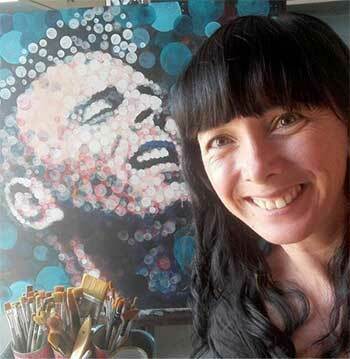 Her initially rather minimalist work has evolved into a new one bright with bubbles and offers a surprising series of portraits which explores a new type of pointillism. For 15 years, she uses the brightness and texture of oil paint, which she loves, to concentrate on revealing the perfect shape or curves. By using a “less is more” technique, she subtly evokes and allows our imagination to run free, oblivious to the effort put into expressing the cleanest of lines. In 2016, she upends her techniques and decides to let loose in order to fully embrace a new creative process. She decides to tackle a portrait theme, radically away from her comfort zone. She nourishes her explorations with the works of painters Amylee and Jimmy Law, whom she admires, and surprises even herself with her new style. Her subjects come slowly to life, their soul emerging through the thousands of transparent bubbles created with acrylic paint. This meditation-like process has slowly taught her to trust, to trust herself, and to relish the moment when the portraits are revealed, with a last circular brush of bright paint.